Yesterday , was one of those days where I just needed to recoup from a very intense stretch consulting work. Longer days than usual, and lots of New York Metro pressure than I would like on a daily basis. So, with the weatherman telling me that we would have some fairly nice outlooks for this weekend, I decided to spend less time playing with my computers. My plans included included resuming and catching up with some of my blogging.. You've seen some of that already . But my highlight for the day was for me and my Queen to head down to Chinatown in NYC. Our plans: do some food shopping , correction some "window" food shopping and course, just take in as much we could of the Chinatown scene. Given that Little Italy is also right next door to Chinatown, we would stop there too. If you do not know, Manhattan's Chinatown nowadays contently fuses with it's Italian neighbors. Great combo, isn't it ? I sure do think so. The plan worked out. So do read on. I spent the early morning downloading and organizing food photos that I had shot over the past few weeks. Then I uploaded a few to this blog. I completed a few posts, and setup a few more - 5 are still in draft mode as I write this one . While collating my materials, I stumbled upon - somewhat miraculously- the name of Rosetta Constantino. Say who ? The name immediately stood out. My first cousin, who lives in Calabria is also named Rosetta . Over the years, including my times in the :"Scuole Medie and Liceo", I 've come to know many other women by this name. So the name was was bound to catch my attention. But of course there was much more than the recognition of an Italian woman's name to this story. 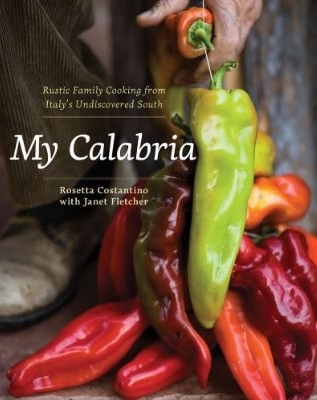 To my surprise, Rosetta Constantino had recently written, along with a few other creative collaborators, a specialty cookbook my entitled "My Calabria". I immediately knew that I had found this month's golden nugget. It was the first time, that I came across a cookbook specifically on Calabrian cuisine. Dig a bit deeper, follow a few links and I got a fuller story. Rosetta was born in the northern part of Calabria, a small town called Verbicaro. A real paesana,. the author along with family moved to the San Fran Bay area during her teenage years. Very envious about that, the SF bay part that is .... It's my favorite place in the US. As I researched further, I was extremely proud to find out as a Calabrian that the author had also earned a degree from Berkley and that today she is following her culinary dreams, cooking, teaching and writing . Career switcher ? Looks like it. To be honest, I sense a bit of bittersweet here too , as I see another example of the "Fuga dei Talenti", the loss of intellectual capital from our beloved Italy. But that is a theme left best for a lesser happy day discussion. Rosetta Constantino, blogs at Calabria from Scratch and shares her passion at Cooking with Rosetta. Cover of My Calabria Cookbook - By Rosetta Constantino et al. So let me fast forward. Just hours ago, I picked up her cookbook, My Calabria. My fellow Calabresi living abroad, this is a must have for your culinary library or and at the very least, something that should be sitting in your living room coffee tables, as a prized and proud possession, an ethnic-cultural attestation to our - stubborn and "capotosta" roots. . Go run to your favorite book store - if you can still find one near you - and get your own copy of this little gem. Mine will be be increasingly cherished as I continue to romantically reminisce of the world that I left behind two decades ago. If you are lazy, then Amazon too can deliver one to your front door and get you on your way your Calabrian culinary journey. I perused through the entire book while I downed a two skinny lattes at Barnes and Noble. As flipped and thumbed way, I could see my land, I could see "La Mia Terra" , and recognized the many delights that so much influenced my culinary tastes and techniques and heart. I saw the rich overlaps with my own dishes, and those of many people around me, especially on holidays. But most of all , through images of Rosetta's mom's hands, for short moments, I relived experiences of tomato puree' and paste making during those warm , breezy summer months in Southern Italy, when time seemed to slow down for the more important events in life. There is an untold joy in the stories of home food processing. Something very serious, beyond the hobbyistic efforts that most of us can imagine today . Those beautiful, clean motherly hands, prep'ing, canning, cooking, and at times, scorched by sun and labor, dutifully remember the responsibilities and subsistence struggles of our Calabrian past. Today we enjoy all the celebration of home and handmade foods, but years ago it was part of life, hard life. I am sure many immigrants can relate to this. Not only those of us who have come to the US from the tip of Italy's boot. I tip my hat to all us. In the near future, the book might just inspire me to undertake my own version of a Julie and Julia adventure. I am searching from a special project. But for now . let me just leave you with some pics of "della mia Calabria" , "My Calabria" in Rosetta's words. Enjoy some history , some nature, and of course , some food. "Ni Vidimo .. Speriamo Priestu"
Fantastic pictures posted here and lovely food photos as well. Thank you for such a wonderful review. Let's hope that the rest of the Calabresi find out about the book.